home > Calendar & News > Latest News > 6th Form > Russell Hall was filled with ‘the sound of music’ at the ‘Leavers’ Concert’. The Leavers’ Concert marked the end of music at WGS for Upper 6th Form pupils Amy, Ellie, Demelza and Catherine. 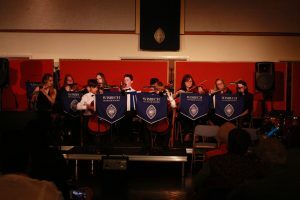 There was a fantastic atmosphere as the evening started with the Chamber Orchestra playing Mozart’s “Concert Overture”. Just Flutes, directed by the super talented Mrs Garford, performed a lively “Cachuca”. Training Wind Band performed two pieces, producing a lovely blended tone. Jazz Band, led by Mr Garford, gave renditions of classics, “At Last”, featuring Catherine on vocals, and “Spooky”, with vocals from Charley Kirby. The Arcadia Ensemble, under the expert guidance of Mrs Harding, performed some medieval pieces, featuring Demelza on the top line, as well as the famous Bach/Gounod “Prelude”. One of the highlights of the evening was a movement from a concerto for two cellos, which featured Prep 6 cellists Tom and Jasper. 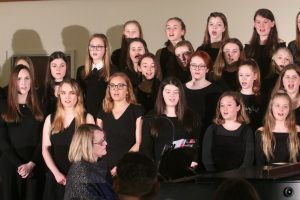 Cantus Choir, who are becoming a vocal force to be reckoned with, gave vibrant performances of “Fields of Gold” and “Fernando” – no musical evening is complete without Abba! Special mention should be given to the newly formed Allegro Strings, who were impressive in their performance on Mozart’s “Eine Kleine Nachtmusik”, led with vigour by Mr Williams-Wandoch. 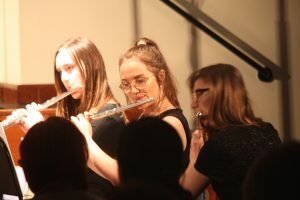 Music Scholar Ellie, captured the audience with her performance of “Legally Blonde” and Steel on Steel brought energy and fun to the proceedings with “Bare Necessities” and “Riptide” under the direction of Catherine. WGS are extremely grateful to all of the performers who gave so much energy to the evening and have worked hard throughout the term in preparation for it. A particular mention must go to our wonderful Upper Sixth pupils, who over many years have contributed so much to the success of music making in School. Amy’s heart-warming performance of “Memories” was full of emotion. Demelza’s dexterity on the recorder in the medieval pieces was joyful. Ellie filled Russell Hall with a powerful and assured performance from ‘Sister Act’, as well as playing clarinet in the Orchestra. 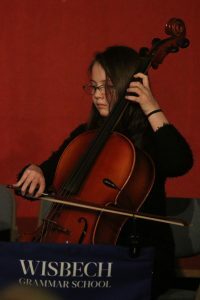 Catherine demonstrated impressive musicianship and versatility as she moved between instruments – violin, saxophone, flute, piano, drums and vocals. She was at ease with the challenging Rutter “Waltz” on flute, extracted beautiful lines from the Steinway in Grieg’s “Notturno” and captivating in “At Last”. We wish all of our Upper 6th Form musicians the best of luck in their onward journey and thank them for being wonderful role models to younger pupils.